After a good few years of being the sole hybrid luxury sedan at a reasonable price, the Camry Hybrid finally has a competitor in the new Accord Hybrid. The Honda isn't just a handsome design but packs some serious technology and high levels of kit. We got to spend a short time with the new HCIL flagship in Hyderabad and the first impressions are great. 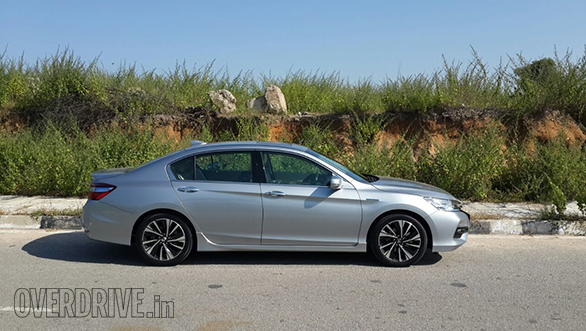 The Honda Accord Hybrid gets a sharp and handsome design that while new, remains faithful to the shape of the last-gen Accord that was sold in India. While there isn't a bad angle on it, we really like the face with those futuristic looking full LED headlamps with auto leveling and an active cornering function. Smartly running out of the headlamps is a thick chrome strip that extends across the grille. Beneath the lights is a nicely sculpted bumper with LED fog lamps placed on the air dams. The side profile is clean with a strong crease running along the shoulder line. Factor in the chrome window trim and striking 18-inch wheels and you have a good looking, well proportioned side profile as well. The rear completes the look with detailed LED lamps and a lip spoiler that adds just the right amount of muscle. The cabin feels both high tech and luxurious the moment you enter. The first thing you notice is that there are two screens on the dashboard. The lower one is your typical touch screen entertainment system and it supports both Android Auto and Apple CarPlay. The Honda Accord Hybrid uses a 360W 7-speaker audio system that includes a pair of tweeters and a sunwoofer. The upper screen is what Honda calls the intelligent multi information display. The i-MID is controlled via steering mounted buttons and we'll get to its purpose in a bit. The instrument cluster that uses a large central mounted analogue speedo that wraps around digital readout for trip, efficiency, odo and temperature data. Flanking the speedo on either side are digital readouts for the hybrid functions like battery charge status as well as a fuel gauge. Aside from displaying navigation and other settings, the i-MID doubles up as a video feed for Honda's unique blind spot warning system. Where most systems use sensors and a ORVM mounted flashing light to warn of vehicles in the blind spot, Honda takes a different approach. The Lane Watch uses a camera mounted in the left ORVM that displays a steady feed to the i-MID. The driver can choose to keep it running all the time or bring up the feed when required by pressing a button on the headlamp stalk. Keyless entry and push to start are standard features as is a one-touch open/close sunroof, auto headlamps and rain sensing wipers. There's a neat function built into the key that allows the car to be remotely started to cool the cabin down. The system shuts down after ten minutes if the owner doesn't enter the vehicle. The dual zone climate control system also has an intelligent feature where it can identify the direction and intensity of the sunlight and adjust output accordingly. It also has an air purifying function. 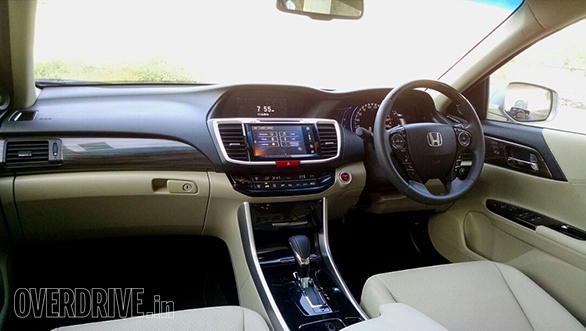 Honda traditionally makes great seats and the Accord Hybrid's are no exception. The driver gets an 8-way power seat with power lumbar support and two memory functions while the passenger seat is 4-way adjustable. Rear space is generous and the bench is comfy and supportive. Unlike the Camry Hybrid, the rear bench is not recline adjustable but the rear left passenger can adjust the front seat by using the side bolster mounted buttons. Honda hasn't shared the exact figure but on account of all the hybrid equipment the boot is quite small, about the size of a sub-4m sedan's. 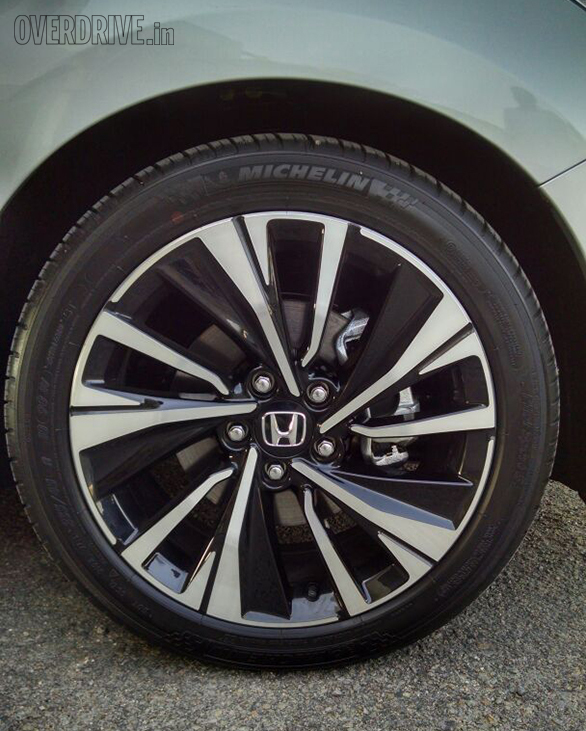 Honda chose to use tubeless Michelin Pilot Sport 3 instead of run flats or low rolling resistance tyres as those types of tyres don't fare well on our roads. Honda does provide a puncture repair kit and a spare tyre will also be strapped to the boot floor when the car goes on sale, although this will significantly eat into stowage space. There is a serious amount of engineering and technology that goes into the Accord Hybrid drivetrain that warrants a separate article. Instead, we'll give you a briefer version of how the system works followed by the driving impressions. The hybrid essentially uses a 2-litre petrol engine, two electric motors and a CVT transmission. The petrol engine has been specifically designed for this application and runs on the Atkinson cycle. The 1993cc engine uses Honda's i-VTEC valve control system as well as E-VTC (Electronic Variable Timing Control) which constantly adjusts the intake camshaft phase with the variable valve timing. Output is a modest 145PS@6,200rpm and 175Nm@4,000rpm as the focus is largely on efficiency. Unlike a traditional mechanical CVT the Honda E-CVT system doesn't use a mechanical pulley or belt but instead has two electric motors. Honda claims the system is no larger or heavier than standard but offers optimal control which enhances response and efficiency. The Accord Hybrid uses two electric motors, a propulsion motor that drives the front wheels and a generator motor that creates electricity. The propulsion motor is driven by an Intelligent Power Unit that resides behind the rear seats. The IPU consists of a DC-DC convertor and a 1.3kWh battery pack. The batteries used are new age Li-ion units similar to the ones in the Clarity Fuel Cell vehicle. 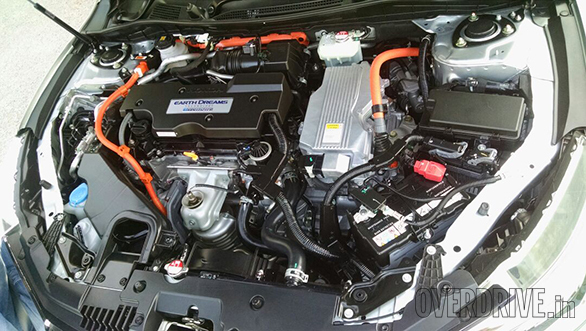 The higher density batteries offer packaging advantages over the older nickel metal hydride ones used in the Camry hybrid. Peak output of the propulsion motor is 184PS while the peak output of the combined system is 215PS. The hybrid system has three driving modes. Pure EV runs off the electric motor alone and can power the vehicle for a maximum distance of 2km at moderate speeds. Hybrid Drive mode is essentially a series parallel - the propulsion motor powers the front wheels while the engine provides power to the generator motor, which in turn charges the battery pack. The car will spend most of its time in Hybrid Drive mode. At medium to high speed cruising, the drivetrain will shift to Engine Drive mode. This system works as a parallel hybrid where both the petrol engine and propulsion motor work together when required, during quick acceleration for an overtake, for example. 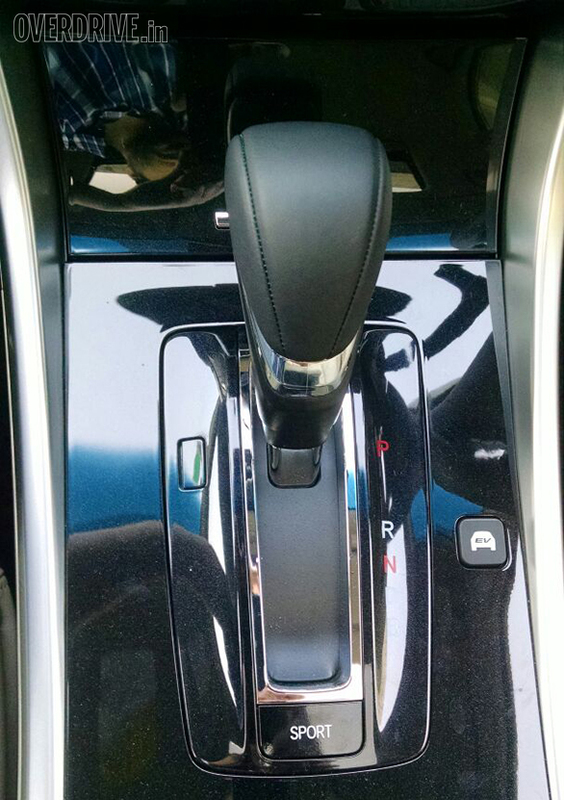 The driver has an EV button that can lock the car in electric drive mode till the juice runs out. This feature is helpful for situations like driving out of a quiet neighborhood. There's also a Sport mode button that adds extra juice through further battery assist to the propulsion motor. 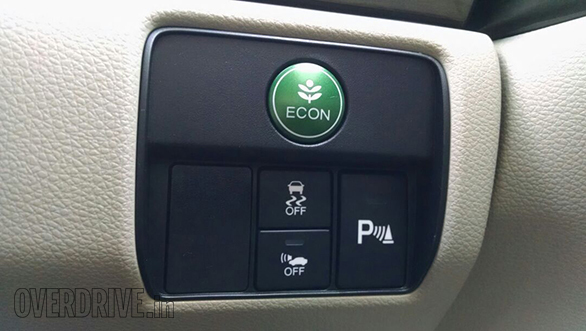 Alternatively, the ECON button dulls down throttle response in the quest for better efficiency. Finally, the gearbox has two drive modes - D and B. D is the standard drive mode which allows the car to coast when the driver lifts off at high speeds. B or Brake mode introduces stronger engine braking when lifting off the accelerator, good for spirited driving on mountain roads. 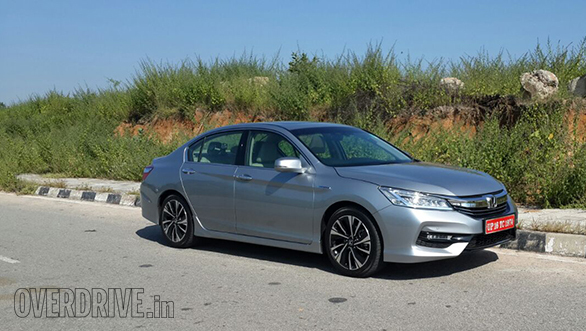 We had very limited time with the Accord Hybrid but the immediate impression is that the engine is extremely smooth. So much so, we need to drive it back to back with the supremely refined Camry Hybrid to see which is better. The transition from electric drive to gasoline power is nearly seamless and throttle response is delightfully crisp. The gearbox is quite good as well as far, as CVTs go. There is no escaping the typical CVT roar of revs under acceleration but the engine quickly settles when the speed stabilises. High speed cruising is effortless and the engine easily reaches speeds of 140kmph with plenty of juice to spare. Honda claims a segment best fuel efficiency of 23.1kmpl but we will only be able to comment on that when the car comes for a full test. Our entire drive route consisted of the smooth Outer Ring Road in Hyderabad with a few rough patches leading there. Suspension set-up is clearly biased towards comfort and offers plush ride quality. I'm not sure if it's better than the gold standard set up by the Camry Hybrid buts excellent nonetheless. Also excellent is the sound deadening, road noise at highway speeds are as good as any top of the line German limos. The Accord uses an active noise cancellation system that uses dual microphones, an electronic processor and the audio system speakers to cancel out low frequency sound in the cabin caused by rough roads. The system works whenever the car is running and regardless of whether the audio system is on or off. With arrow straight roads we can't comment on the handling characteristics but I suspect this car will be a more involving driver's car than the Camry but not to the point of its European combustion engine only rivals. Front, side and curtain airbags are standard as is ESP, traction control, hill assist, four-channel ABS and brake assist. The body is designed to be both impact absorbing as well as pedestrian safe. The electronic power steering has a function that initiates steering input to help the driver steer the car in the right direction. This works in extreme cases that cause instability like heavy braking on surfaces with different levels of friction (partial snow or gravel) or to mitigate potential understeer or oversteer. The Honda Accord Hybrid is a handsome car that's stuffed to the gills with kit and promises to be quite nice to drive as well as extremely comfortable. The Camry Hybrid should be very worried but the Toyota does have an ace up its sleeve. Being locally assembled allows it significant tax breaks as well as incentives from the government's FAME policy. 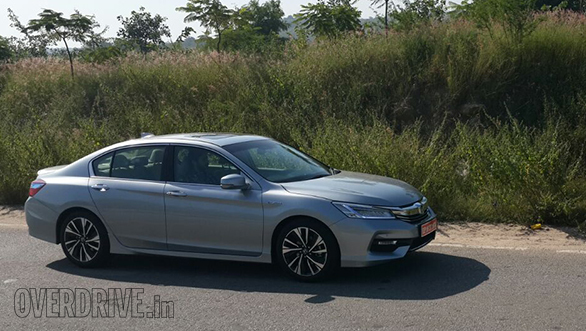 The Accord is a CBU only which means it will probably be priced quite higher than its Rs 28 lakh rival. If Honda can pull off a competitive price at the October 25 launch, this car will not only be a great alternative to the Toyota but also to more expensive German cars.